New World Stages is an award winning state-of-the-art theatrical venue just west of Time Square. It is constructed on (and under) the site of the former Madison Square Garden. 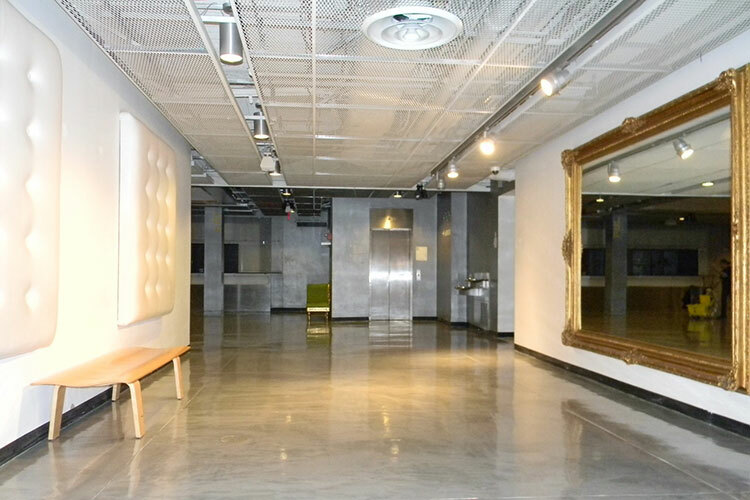 The newly renovated underground facility is centered on a large lobby and public art gallery. Shortly after its renovation, the flooring at the bottom floor was having problem due to the moisture vapor transmission. The floor was painted and it was delaminating in several different areas. Duraamen was contacted to look at the floor and offer recommendations to fix the floor. It was evident from the dampness at various places that the problem was moisture transmission. From the available records, it could not be ascertained that there was any moisture vapor barrier below the slab. The project was executed by Mirage Finishes based in Valley Stream, NY. The project has to be executed in three weeks working two days in a week. There were no shows in Tuesday and Wednesday of a week. Therefore, the work had to be started on Monday after 10:00 pm and it was expected to be ready for foot traffic on Wednesday at 4.00 pm. In the first week, the floor was shot blasted, moisture vapor treatment was applied. There was one deviation from the steps described above in the actual execution of the project. The shot blasting of the surface created a very uneven surface. The application of Perdure MVT+ at 1/4″ thickness did not give a smooth surface. Therefore, a thin coat of Skraffino, concrete micro-topping was applied over Perdure MVT+ to even out the surface. In the second week, two coats of Lumiere, reflector metallic epoxy coating was applied at a combined thickness of 15 mil. The color chosen was Bright Silver. In the third week, it was top coated with Perdure U90. The work was completed last week and we are told that the management of New World Stages receive great compliments for their new floor. Watch the detailed installation process of Lumiere metallic epoxy coating.